Set of 4 includes Power Recline, Power Headrest, Power Lumbar, USB port LED and Top Grain Leather Match. Available in Black ONLY. Straight Rows. The Strata LHR (Lumbar Head Rest) is what results from years of effort and experience to develop the perfect blend of comfort and good looks. There is so much built into this premium theater seat that it surprises even our in-house experts. Elegant diamond stitch patterns, power lumbar adjust, power headrest, power recline for the seat backs and footrests, and the list goes on and on. The power controls located on the inside arm form the nexus of this seat. From those controls, all you need to do is move your fingers and the chair does the rest. Float back to the perfect viewing angle as the footrest rises and you adjust the headrest. Easily find that lumbar support that helps you relax. It’s all done at the touch of a button. The Strata home theater seat comes with storage arms which provide the perfect location for your remotes and TV guides. Removable cup holders are easy to clean and are constructed in a sleek black aluminum finish. The ambient lighting package will illuminate the base of the chair and the cup holders. A USB charging port will make sure you don’t find yourself having to get up and hunt for the nearest charger in the house. The Strata also offers hidden storage in the arms along with removable cup holders. Ambient base lighting under the seat and in the cup holders are controlled at the push of a button and set the mood for the perfect movie night with your family or friends. 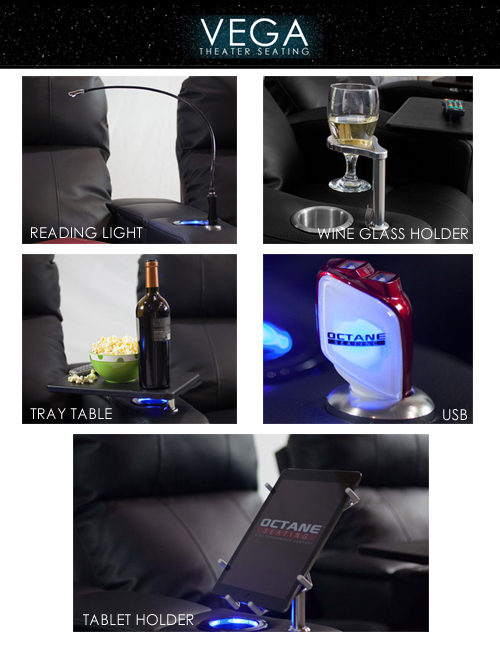 The armrests also have our accessory dock which is the stainless steel dock that supports the full assortment of fun accessories like reading lights, tray tables, wine glass holders and so much more. These accessories give function to your recliner that is both fun and convenient.